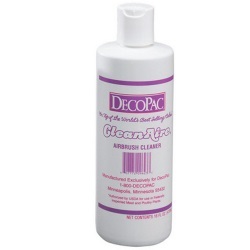 CleanAire will safely clean your airbrush and other bakery tools of food color stains. Fill airbrush color cup or color bottle with CleanAire. Spray onto a paper towel until stream runs clear. Or, apply directly to bakery tools and scrub.